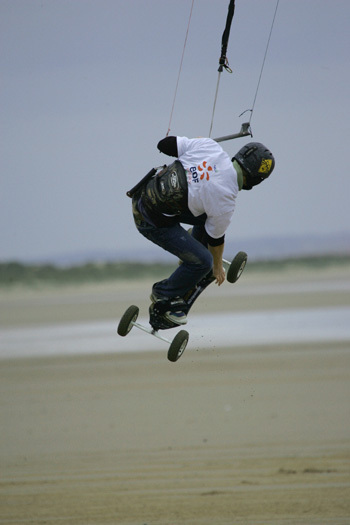 This sport is the most similar to kitesurfing in the equipment it uses – kites can be inflatable or foil type. Sizes 3 – 15 m.
The most common sizes however are 3.5 – 12 m.
The kites can be flown with a bar or handles and can have 2 lines in their simplest form to 4 lines enabling the kite to be depowered. Boards are made from wood or composites with Alloy trucks and Pneumatic tyres.